Join the discussion on our forums! Come discuss Sudden Genesis over in our dedicated Sudden Genesis discussion topic. Summon copies of your damaged minions. Being hurt can make you another person. I like to think of this card as a "Build-your-own Grim Patron." Turn 9 opponent: Use literally any hard removal or trade with minions if available. I run this in my taunt warrior deck and by this point in the game my opponent is out of hard removal. Unlike Blood Warriors, this card doesn not synergize with Fire Plume's Heart, because the quest requires Taunts to be played from hand, not summoned. Won't see much play, if any. 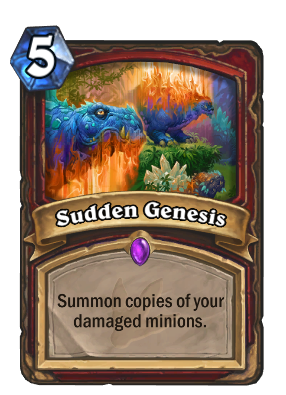 Assuming the copies this summons are also damaged, then this actually has really crazy synergy with Blood Warriors; if you have even just two damaged minions on the board then not only will this combo get you two Faceless Manipulator procs but you add four more cards to your hand. Yes it's an 8-mana combo but the value could be immense in the control mirror (imagine getting two extra copies of Twin Emperor Vek'lor AND one more on the field at the same time) or help you stay alive against more aggressive decks if you duplicate and copy stuff like Alley Armorsmith or Ancient Shieldbearer. This is the kind of long-form attrition based gameplan that Warriors have historically been the best at, at least pre-Pirates. I dunno, sounds pretty powerful (and fun) to me. And besides, what other viable Control Warrior deck archetypes do you see popping up in Standard? Quest Warrior seems more midrange-y to me if that turns out to be as strong as it looks, so I think this card is worth remembering if you like full-on control decks. If what youa re saying is correct, here is an idea. Do you remember giant mage? Maybe warrior will be able to make use of a ttk combo of 2 arcane giants whirlwind sudden genisis blood brothers play 3 more arcane giants and still have a giant left in hand. Maybe that could be a cool new concept? May be it sees play in Control Warrior with Leeroy Inner Rage Combo. The other useful thing could be 2 Taunts on board then Deal 1 to all and copy them. I like it. Some potential for insane value. Would have been pretty cool with Grim Patron, but ah well. Great in Taunt Warrior, and means those Whirlwind effects aren't dead draws late game in other control decks. Plus, it's just a cool idea. Terrible. Unless taunt warrior becomes very good, in which case it could be alright-good. But it's a dead draw the majority of the time. COPIES of damaged minions do you understand what that means? The difference is that this gives immeadiate board presence and blood warriors is normally used to double up on battlecries, getting a second reno. How exactly are you keeping that enraged Grommash Hellscream on board? In world of INFINITE MANA it could work.